We woke up this morning to find we were both to sore in the wrists for doing yoga. We had planned one session before renting a motorbike, but instead we went straight to adventure mode. My friends went to Japan and rode Harley’s. I got myself a Honda. We got a motorbike(?) delivered to the hotel and plotted a course for Padang Bai. It’s not to far a drive and next to Padang Bai is there a “Secret beach”. This beach is on the top ten list of beautiful beaches in the world, but I guess there are more than one such list. 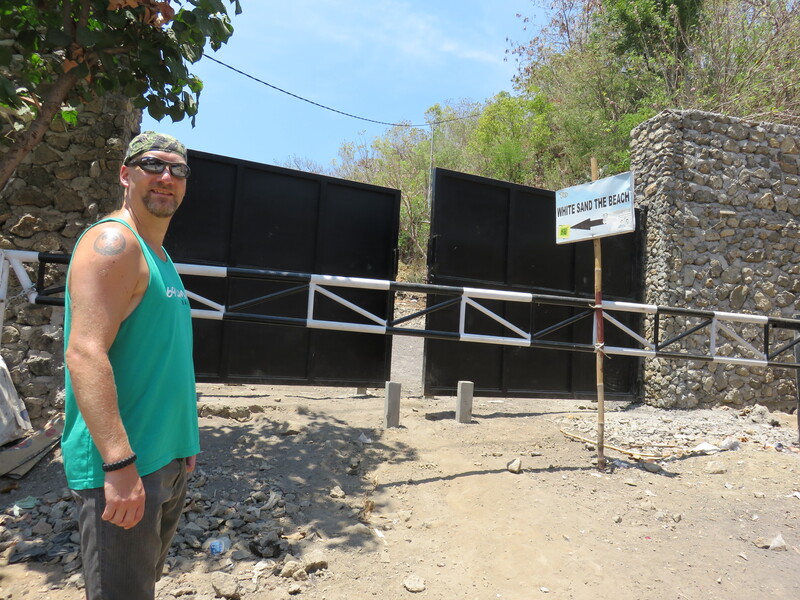 We are now more and more comfortable with driving here on Bali. My shoulders are not as high, and we flow more with the traffic. Today we even ventured out onto a “highway”. The traffic is heavy, as I have written before, but it does not move to fast. Even in the highway we did not go above 65 km/h. But trust me, it’s fast enough when you are air rounded by bikes and cars that think all markings, signs and lanes are optional. The only markings or regulation that seem to be respected are the traffic lights. Of course everybody tries to place themselves so they can be first into the intersection, but at least nobody runs a red light. today, but no one can really explain it to us. “More than a normal day”. Is the best explanation so far. There are huge offerings at every temple, and there are performance of kids dancing. We have not been able to go inside a temple yet, as we are not properly dressed today. We need a sarong each to go inside, of which we have only one. Not that they are hard to come by around here, but for just taking a peek an the temple… Nah. squat. 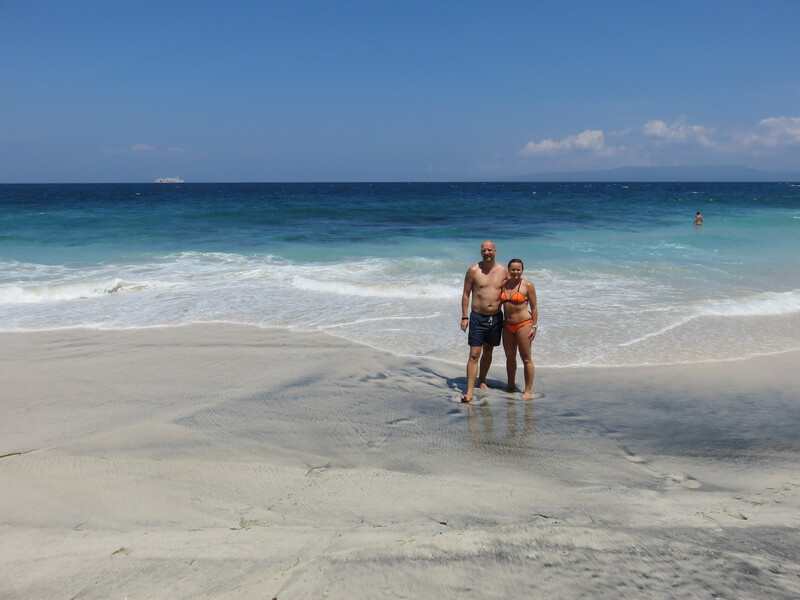 “White sand beach” on the other hand, will make everyone you ask point in the right direction. We were told that it was a bit of a climb to get there. As we have been navigating the Norwegian fjords to get into places suitable for taking a swim, we anticipated a lot worse than reality showed us. About 15 minutes walk from “downtown”, 10 minutes up and 5 down. Reverse when returning. No problem what so ever regarding access. On the way back we met a European girl who asked if it was worth it. At this point she could see the beach, and had 2 minutes left to walk down. Maybe we should have said no, just to see if she turned around, but we’re to polite to do such a thing. I guess our ma’s and pa’s are proud of their offspring. It was totally worth it. 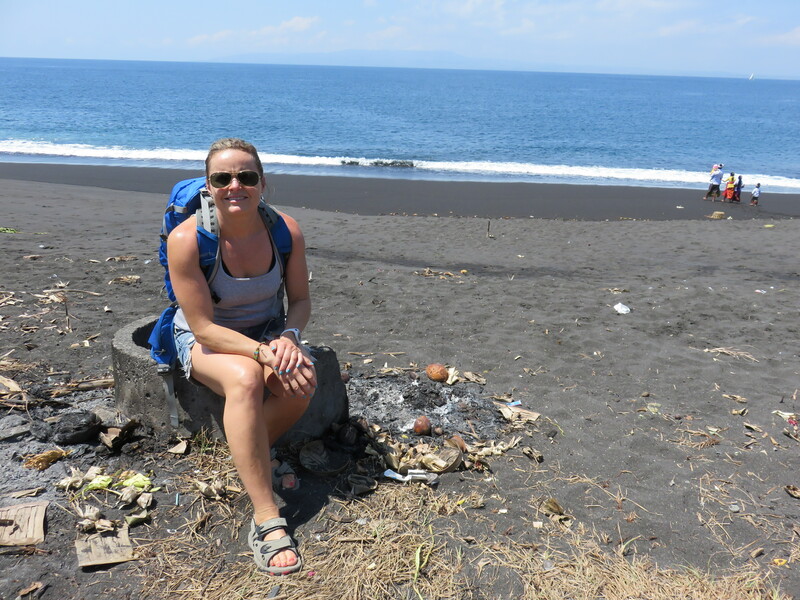 As we described was the walk over to the beach no big deal, and the beach was stunning. Clear white sand, blue/green water and few people. We had lunch at one of the two warungs there and enjoyed a reasonably priced meal. No Michelin star of course, but more than enough to keep us happy. We went for a “swim” also. As some of the pictures show; it was quite the heavy surf there. The waves crashed in with real power. We went out, but did not get past the breaks. At one point I was hammered to the sea floor and came up with a free cleansing of all bodily openings. But it was worth it. The people that were selling things on the beach was the only real nuisance. The ones that hunker down next to you and put their goods onto your book, blanket or towel. But they were few and after a (couple or maybe four times) stern but polite, “No thank you”, they moved on. 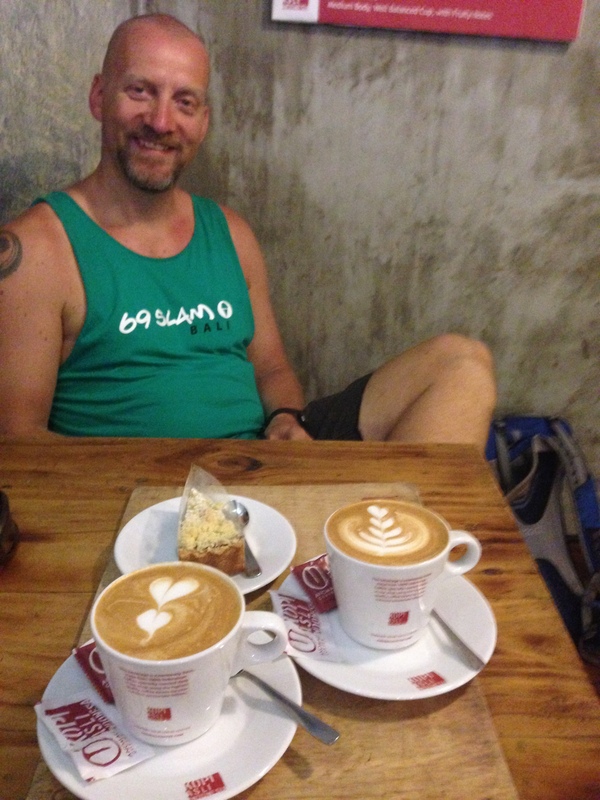 The drive back was rather uneventful and we got back into Ubud and went for a coffee. or Kopi as it often is called here. In the last post I mentioned the P for F, thing. As prices may be Pipty instead of Fifty, Kopi is not Copy, but Coffee. In the first week I thought there where insanely many copy shops around, but alas, it’s a lot of coffee shops. We rounded the day off with a steak at Cafe de Artistes. 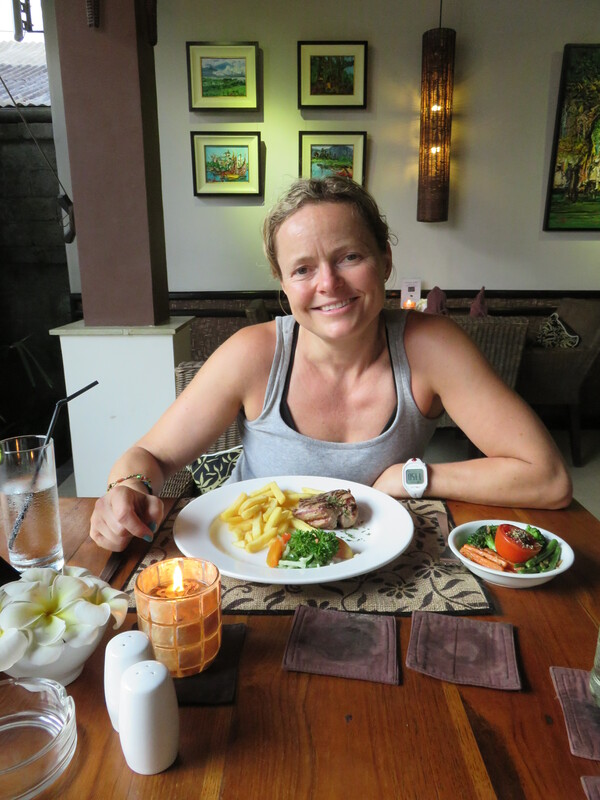 So far, and by far, the best steak in Bali. Tender and full of flavor, to a price way better than what we’ve had before. Fueling up the bike, take a shower, put after sun lotion on red and burnt skin, wrap up in blanket in bed, read book, say good night. And as a last little thing: We will not be on Facebook for a while. As there are a lot of Free WIFI around we tend to bring up the phones and surf away. Among the sites we visit is of course Facebook. After a very short talk about it we decided to ditch Facebook and use that time for more informative reading. First for a week, then we’ll see where we go from there. These blog posts will still be announced on Facebook as WordPress is integrated and automatically posted on my behalf. 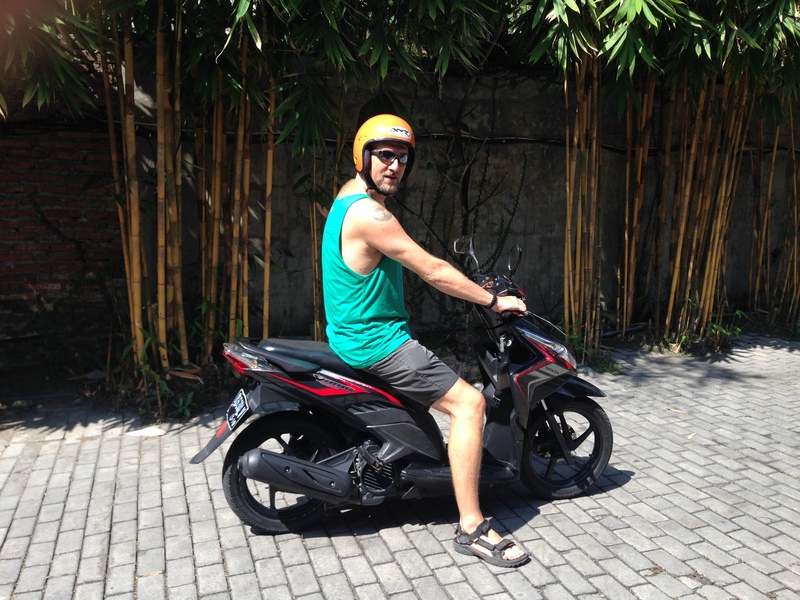 Categories: Indonesia | Tags: Bali, Indonesia, Motorbike, Ubud | Permalink. 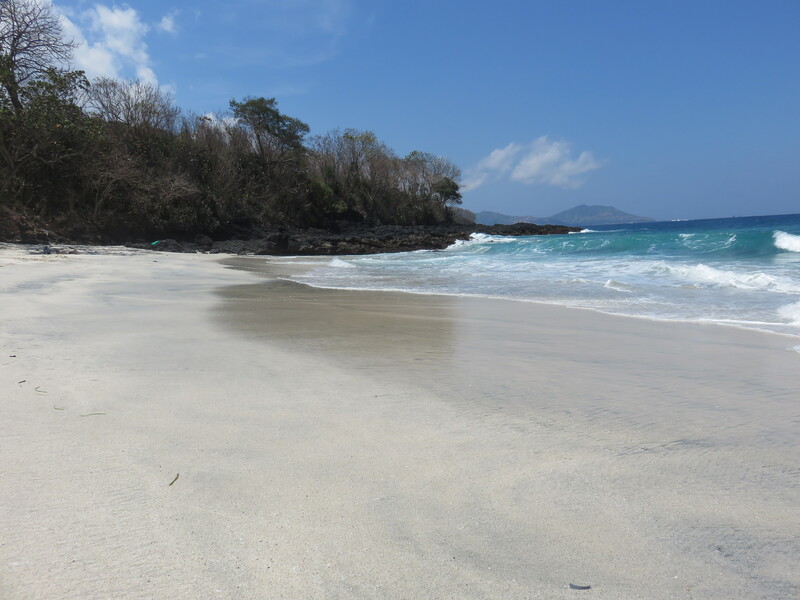 – Visit the White Sand beach near Padang Bai – to see the nice white sand and chill for an hour or to. – Take seafood dinner in Jimbaran and enjoy the sunset. They can probably serve you the Piña Colada too. and most of all: ENJOY your trip to Bali. Have fun, be cool and stay frosty!